My Oncologist had never heard of them, she looked them up when I was in the office to see the ingredients and tried to find published studies but couldn’t. She said she wasn’t opposed to me using them on my dog but to wait after Chemo and he’s already on milk thistle. How much are these to buy online and are they beneficial in other’s experiences? Apocaps CX Apoptogen Formula for Dogs is a nutritional support supplement for dogs. 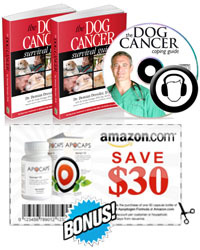 Created by Dr. Dressler, author of the Dog Cancer Survival Guide, Apocaps helps support your dog’s health needs with the natural supplements of luteolin, apigenin, curcumin and silymarin. Also included are gingerols, beta glucans, and l-glutamine. How do these ingredients increase life quality? Because they contain “Apoptogens,” which have been shown to support the normal turnover of unhealthy cells to help build new, healthy ones. Apoptosis, or maintaining normal cell turnover, is Dr. Dressler’s primary strategy in keeping dogs healthy when their immune system is compromised. The Apocaps CX Apoptogen Formula for Dogs is the way he delivers this therapy. As we said here in this Tripawds Nutrition Blog post, Apocaps contains ingredients that are technically available to everyone. Yes, you can combine your own combination of apoptogens to create a similar supplement, however there’s a big chance that your formulation won’t make it into the bloodstream. The key to Apocaps is Dr. Dressler’s formula, which is designed around a proprietary, patent-pending process that “tricks” the body into circulating the apoptogens throughout the bloodstream. Another benefit of Apocaps is that you won’t be guessing how much of each ingredient you need to include for an effective formula, which reduces the risk of gastrointestinal upset. Apocaps are one option in an array of nutritional supplements to help your dog stay healthy after being diagnosed. We realize that while it’s not an inexpensive supplement, there are some great Apocaps sales that happen frequently on Amazon. More information can be found on the Apocaps website. All Apocaps CX Apoptogen Formula for Dogs sales made through these links help to support the Tripawds community. Thanks for shopping with Tripawds!